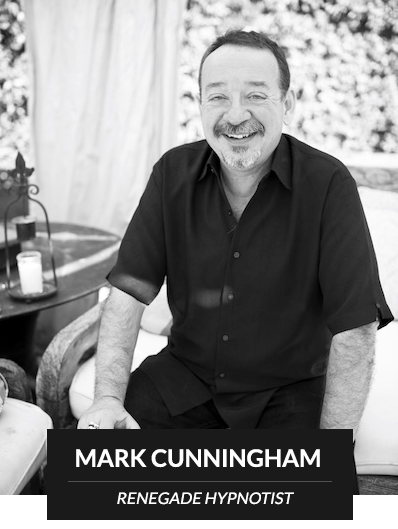 Mark Cunningham is one of the genuine rebels when it come to the pursuit of maximizing human potential. As one of the most experienced hypnotists in the world, he authors cutting-edge classes, trains physicians and therapists in the use of hypnosis as therapy, and gives Human Potential / Sexuality seminars and live events throughout Europe, North America, Australia and Asia. Because of this Mark has become one of the world’s most sought after experts in hypnosis, as well as relationship coaching and sexuality training. Mark’s unique approach is the result of nearly 40,000 professional clinical hypnosis sessions, and results in rapid, permanent changes to identity, beliefs and behaviors. This “Renegade” approach to change-work results in a nearly 100% success rate for Mark’s clients. Rather than refer to it as ‘therapy’ Mark prefers to call it training for your mind. His belief is people aren’t broken, they are just doing certain behaviors or have certain thoughts that are less than optimal. So from this The Renegade Hypnotist Project was born. The Renegade methodology is designed to remove stress, eliminate negativity from memories, enhance imagination, open people up to sensuality, instill the ability for women to experience full-body orgasms at will, and to allow the healthy expression of primal sexuality in every area of life. When he’s not traveling the world, he lives in Florida with his wife and dogs, and his stack of largely useless advanced academic/professional degrees. Enter your name and email to discover the 7-steps to giving women amazing pleasure!